Located on the second floor of the most prestigious shopping centre in the country, Suria KLCC, the KLCC Signatures food court is one of the most popular food courts in the city. Enjoy a wide range of inexpensive international cuisines originating from all around the world while taking in the tranquil sight of the KLCC lake and park. Merely 10 minutes away from Suria KLCC is the Pavilion Mall on Jalan Bukit Bintang which houses another of the most-frequented food courts in the city. 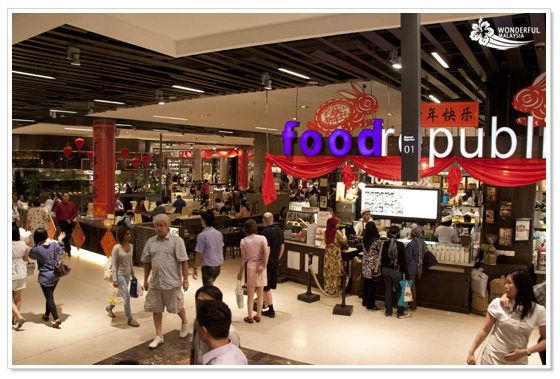 The Food Republic food court is an upscale food court located on the first floor of the mall that dishes out the best of local and Asian hawker and restaurant fare at affordable prices in an integrated open dining concept. 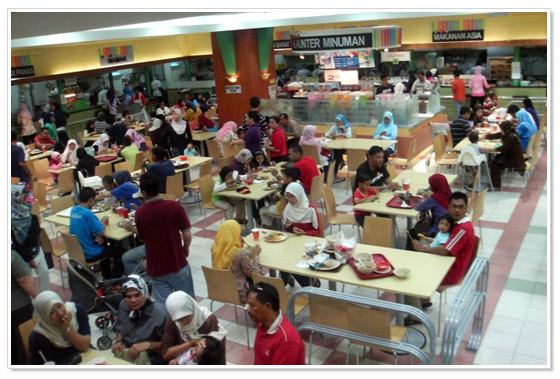 The Jusco Arena food court at 1Utama shopping centre has always managed to attract a huge number of customers. Reopened in the middle of this year after some renovation and upgrading works, the beeline heads back to the Jusco Arena food court at the Old Wing of 1Utama for the much-missed tasty local and international meals and yummy snacks. In the same huge shopping mall you can also find a Foodrepublic. This food court is located within the new wing. A truly hidden gem on the second floor of Mid Valley Megamall Centre Court, the Oasis food court is frequented not only by employees working at the mall but also by shoppers looking for cheap yet delicious meals. 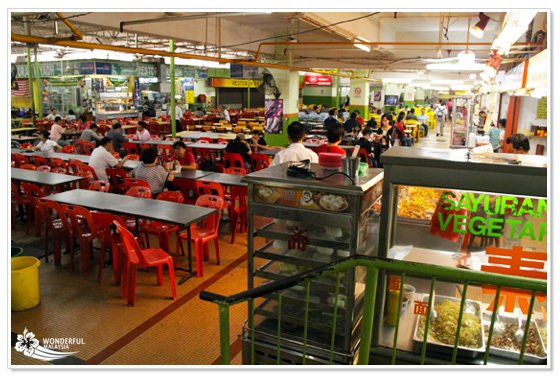 The food court offers local hawker delights in a comfortable air-conditioned environment. The Portuguese grilled seafood is much sought-after here, attracting long queues at meal times while the tantalizing pan mee is a favorite among noodle lovers. Next to Oasis there are another three food courts within the enormous Mid Valley complex; Oasis Food Court, Medan Selara Food Court and the employee food court at the lower ground floor. SS2 Selera Malam, which is located along Jalan SS2/64, Petaling Jaya, is the spot for local and Asian hawker foods. This food court is also known as ‘Wai Sek Kai’ which means ‘gluttony lane’ in the local Cantonese dialect. Among the most popular stalls at SS2 Selera Malam are Stall 62 Penang Heng Seng Lok Lok for its lok lok (skewered meat and seafood dunked in boiling soup to cook them) and yam cake, Stall 51 for its laksa Siam and Penang asam laksa, Stall 52 for its Penang prawn mee and mee Jawa and Stalls 30 and 48 for their Penang fried kuey teow and fried tong fun. The food court is open daily from 5pm to midnight. 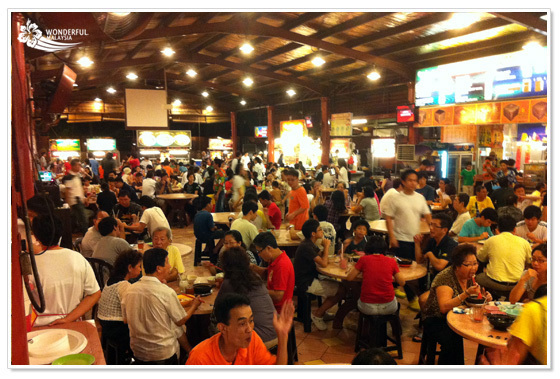 The Hutong food court is an infamous food court located on the lower ground floor of Lot 10 shopping mall. Designed to look like an old Chinese village, the food court has more than 20 stalls selling mainly Chinese cuisine. Vendors include some of Malaysia’s most famous names such as Honkee Porridge, Soong Kee’s beef noodles, Mo Sang Kor’s bah kut teh, Kim Lian Kee’s Hokkien mee and Kong Tai from Singapore. Although Sungei Wang Plaza may be a bit grubby and rundown, the popular mall houses one of the best food courts in the city. Meals don’t get any cheaper than at Sungei Wang food court with prices starting at only RM1.50 for a meal. Authentic Malay, Indian and Chinese food such as curries, chicken rice, noodles and so much more are abundant at the food court. The Damansara Uptown food court makes it to the list of best food courts for two reasons – it offers the best local and international cuisines including Ah Keong’s yong tau foo and chee cheong fun and Steven’s chicken chop and curry fish head all at one location. There is also a night market nearby selling all kinds of knick knacks ranging from clothes to children toys. 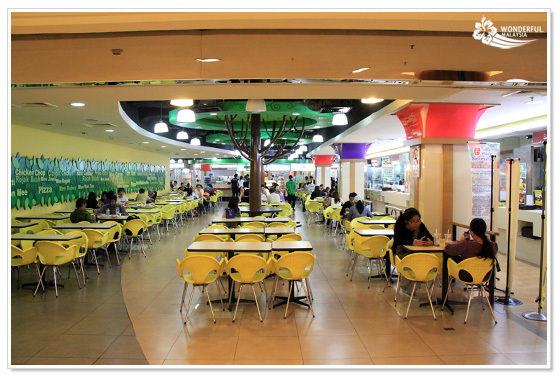 The Damansara Uptown food court is located at Jalan SS21/39 at Damansara Utama. Opened in December 2001, the spacious Ming Tien food court at Taman Megah, Petaling Jaya, is a popular hangout and eatery in the city. The food court has 63 stalls selling local favorites such as laksa, chicken rice, Ipoh hor fun and heritage Baba and Nyonya dishes. There is also a wide variety of cuisines available for those with an international palate. Ming Tien is open 24 hours daily. Popular amongst teenagers and young adults, Asia Café never lacks a huge crowd. Located at Subang Jaya’s most dense commercial centre at SS15, the food court offers an array of local and worldwide dishes with numerous entertainment options such as a cyber café, a snooker room and many elevated plasma TVs for the public.